GenericMedList features medication discount programs that do not have complex eligibility requirements, applications to fill out, additional costs. 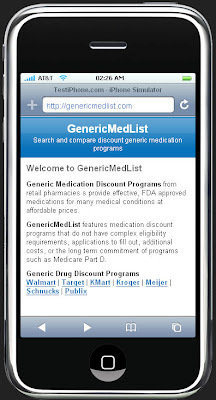 GenericMedList allows iPhone users to search and compare drug discount programs such as the Walmart $4 generic drug program to find the most affordable medications. GenericMedList is a valuable resource for physicians, nurses, health care providers, case managers, social workers, and health care consumers when researching affordable medications. GenericMedList.com uses the iWPhone WordPress Plugin to deliver content optimized for the screen size and Safari browser of the iPhone and iPod Touch. The only drawback to GenericMedList for the iPhone is the need for a wireless internet connection to access the content.